When Pastor Falls was six years old, attending church with his parents, his Dad led him to personal faith in the Lord Jesus Christ. He was baptized and later sensed the call of God to full-time Christian ministry. His interest in the ministry was greatly influenced by his pastors, Sunday school teachers, and Christian day school teachers. When Pastor Falls was ten years old, he spent one month in Costa Rica with Missionaries Terry and Kaye Jones. God used these early influences to endear his heart to the ministry. Pastor Falls earned the degrees Bachelor of Arts in Bible and Master of Divinity. He has also completed some work toward a Doctor of Ministry. He married Sherry in 2000. God has blessed them with three children. 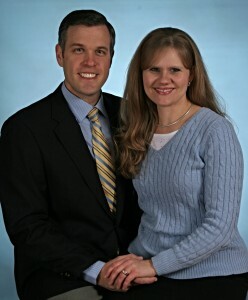 Before coming to Newark Baptist Temple, he served as an assistant pastor in Avon, Indiana (2000-2006) and as pastor of his childhood church in Tuscaloosa, Alabama (2006-2014). The pulpit ministry is central to his pastorate because the Word of God is central to the Christian’s life. Paul commanded young Timothy, “Preach the word; be instant in season, out of season; reprove, rebuke, exhort with all longsuffering and doctrine” (2 Timothy 4:2). This admonition presents three vital elements of Biblical preaching: 1) teaching, 2) authority, and 3) persuasion. “Doctrine”—that’s teaching. “The Word”—that’s our authority. “Reprove, Rebuke, Exhort”—that’s persuasion. Pastor Falls, other staff, and guest preachers present sound teaching based upon the authority of God’s Word that is meant to persuade you to embrace God’s way.